3D scanning and modelling are complex tasks that usually require specialist hardware and software. 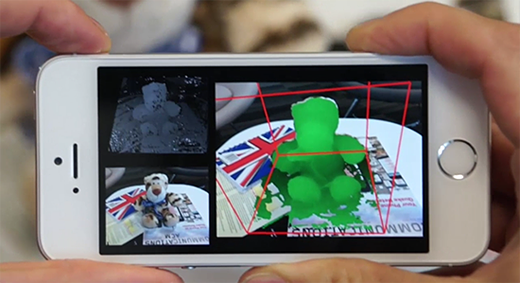 A research project undertaken by Microsoft and the University of Oxford is now aiming to make things easier, quicker and cheaper by turning your smartphone into a 3D scanner. The MobileFusion project has developed an app that can turn objects into 3D models by capturing them with the camera in your phone. The user must walk around the object to capture it from all angles, and the device scans its target by comparing the camera's live RGB data with previous frames. It then takes the live frame and performs stereo matching in order to generate a depth map, which is merged into a 3D mesh model. The generation of the 3D model happens live on the device and progress can be viewed on the screen. This allows the user to see the state of completion and whether any important parts of the object have been missed in the scanning process. The resolution of the finished model still leaves room for improvement but is good enough for 3D printing, augmented reality applications or online sharing. MobileFusion appears to be a very interesting way of creating quick 3D models for printing, displaying in online shops or simply sharing with your friends. It isn't available to the public just yet but there are plans to release apps on the Android, iOS and Windows app stores. It's about time! Go Microsoft!